Dragonships can be recognized by their square sail and the dragon head on the bow. The Vikings had a dragon head on the bow of the ship to protect against the evil spirits of the sea. Without these great ships the Viking Age would never had happened. The steering oar was mounted on the rear right side. This combined with a rotating sail made raiding possible regardless of wind direction. The hull of the ships were made by overlapping planks and securing them with iron rivets. A wool string was dipped in tar and forced between the planks to prevent leaks. Oak trees were mostly used because their natural branching structure provided curves to create streamlined hulls. Sails were made from woven wool. Natural lanolin made the fabric water repellent. Rigging was made from horsehair or walrus hide. 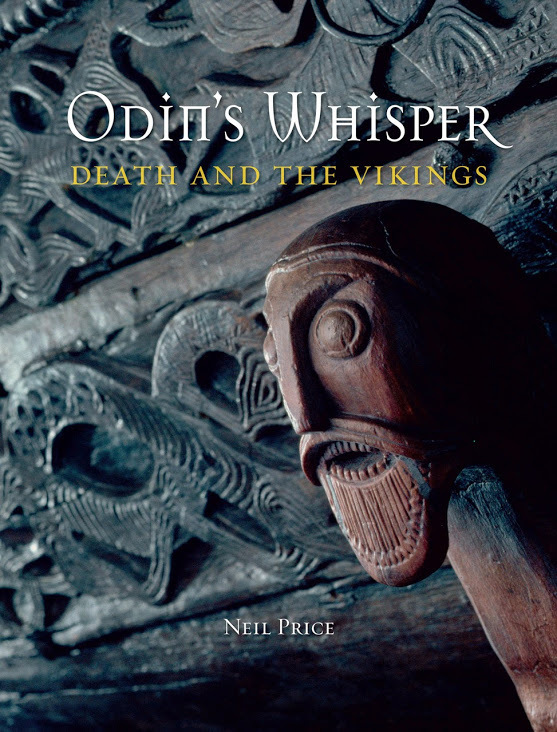 Professor Price’s Odin’s Whisper: Understanding Viking Death Rituals (London: Reaktion Books). Odin’s Whisper: Understanding Viking Death Rituals presents a broad but comprehensive overview of Viking attitudes to death, and through them, provides insights into their understandings of life. The volume begins with a very brief introduction to the Vikings themselves, sufficient to contextualise the main content, but the primary emphasis is on graves. This is a big, photogenic and spectacular subject with considerable public interest, and the volume takes full advantage of this through detailed descriptions and images of Viking burials in all their extraordinary variety. Funerary ritual is not treated here as a separate and containable realm of human experience but instead as one which encodes all the mechanisms by which people communicated with other worlds and located themselves within their own. The Viking understandings of death, such as we interpret them, are of enduring fascination in this context. In particular, their essentially fatalistic world-view, emphasising the brevity and value of life rather than an eternal reward, has much to say to modern audiences. 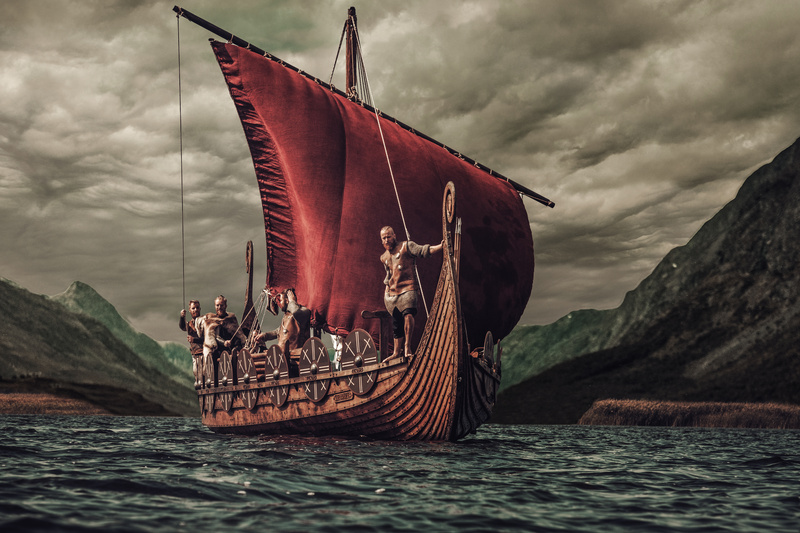 The Vikings have a popular name-recognition and visibility above the vast majority of ancient cultures, and there is an undoubted public receptiveness specifically to the funerary aspect of their civilisation. The Vikings matter to people, and their mortuary rituals can provide genuinely deep perspectives on the fundamentals of life, the fears of mortality that confronted them as they still confront us. Half a million known graves survive from the Viking period. Many contain sumptuous goods of different kinds, and some even include whole ships, wagons or other vehicles. Animals, slaves and loved ones could be sacrificed with the dead. Odin’s Whisper shows that it was in their perspective on death itself that the Viking view of life was most clearly distilled – and it is through an understanding of Viking burial that we can best understand the thought and mythology of this most fascinating of cultures. Odin’s Whisper provides the first full treatment of this subject, giving an in-depth account that uses the stories of Norse mythology and the most recent archaeological evidence to draw a vivid picture of the Viking mind. Neil Price contextualizes the Viking understanding of death within the Ragnarök, the immense battle of living and dead, gods and humans that would ultimately consume all the world in fire, to illustrate that the Viking afterlife was only ever viewed as a respite before this ultimate end. The essential fatalism that marked their conception of the worlds beyond equally informed their funeral practice, as Price illustrates with vivid contemporary accounts of the animal sacrifices, sexual activity and violence that characterized the most spectacular Viking burials. Packed with striking illustrations and reconstructions of graves, Odin’s Whisper covers the full range of Viking burial practice and casts light on Norse beliefs about death – and life. It will be essential reading for anyone fascinated by Viking culture or the human condition in general. Professor Neil Price is professor of Archaeology at the University of Aberdeen. He is currently on a three-year sabbatical funded by a Leverhulme Trust Major Research Fellowship, during which he will spend completing two monographs on Viking burial ritual. Alongside this work, his current research focuses on paradigms of piracy in cross-cultural perspective, and he has a developing interest in the historical archaeology of the opium trade. Together with Rick Knecht, he is also currently directing archaeological surveys of the World War II battlefields of Peleliu in the Palau islands, Micronesia. 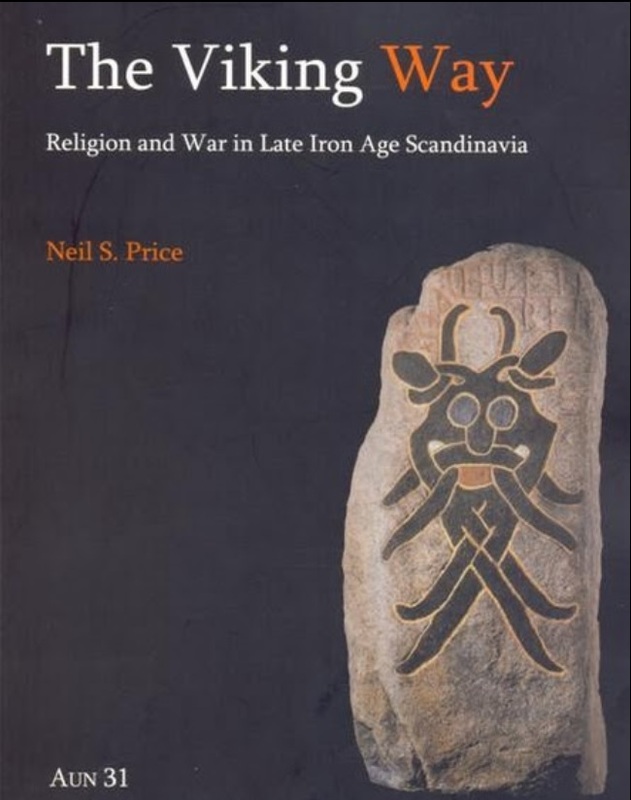 The long overdue and anxiously awaited second edition (an updated version of the original) publication of Neil Price's "The Viking Way: Magic and Mind in Late Iron Age Scandinavia" is supposed to be released sometime around late March to early April 2017, that date yet remains to be seen. 435pages, 159 figures, 3 tables. 2002. Uppsala: Uppsala University Department of Archaeology & Ancient History; 91-506-1626-9 (ISSN 0284-1347).This is an exceptional book which deserves to establish itself immediately as essential reading for anyone interested in seiðr, shamanism, the Sámi, circumpolar religion, óthinn, violence, warrior ideology or simply the Viking Age more generally. Price devotes several pages to the topic of men performing seiðr. There are 12 citations in Old Norse lore to seiðrmaðr or seiðrmenn ("seiðr-man," "seiðr-menn"), including one of the sons of Harald Fairhair. There are also six references to seiðskratti, which seemingly refers to a male practitioner of evil seiðr. There are also reference to spámenn and galdrmenn, among other terms for male sorcerers. Neil Price’s Uppsala dissertation attempts to recapture ‘the subtlety and sophistication of the Viking mind’ (p. 93) in which the pervasive presence of magic – real magic within a real society – was an integral part of the world view. As such, it represents one of the most important contributions to Viking studies in recent years, quite possibly in recent decades. Price’s manner of proceeding is logical, persuasive and theoretically astute. After two introductory chapters, which discuss what an attempt at ‘cognitive archaeology’ for the Viking period would look like, and what the main problems are in investigating Viking magic (especially in its most celebrated form of seiðr) there are three central chapters: the first examines seiðr in fine and attentive detail; the second compares seiðr with the Sámi equivalent (if that is what it is) of noaidevuohta; and the third connects seiðr and noaidevuohta with broader phenomenon of circumpolar shamanism. On the way to these striking and well founded conclusions there is much to learn from and enjoy. Particular highlights include: a reasoned advocacy as to why archaeologists should concern themselves with written sources just as much as historians or literary scholars do; a penetrating account of the ways in which the study of Norse religion became dangerously entangled with Nazism in the course of the 20th century; a brilliant survey of the archaeology of seiðr, with a particular emphasis on the apparent graves of völur or prophetesses; a lucid meditation of a good deal of specialist scholarship on shamanism the world over; a startling vindication of Ibn Fadlan as a prime witness to Scandinavian practices; and convincing re-evaluations of the nature and function of valkyrjur and berserkir. Especially important is Price’s desire to reinstate the Sámi (that is, the people previously known as the Lapps) into the study of Viking Age Scandinavia, to rectify the distortion of ‘a Sámi-less Viking Age’ (p. 239) which standard syntheses of the period depict. The proposal that we should think in terms of a shared Norse-Sámi culture in Viking Age Scandinavia has the potential to effect a profound shift in our perceptions. This is also a very easy book to read Price’s prose is always lucid, and often stylish and witty; the quantity and quality of the illustrations are outstanding and the bibliography is enormous. One complaint, though, is that there is no index (perhaps as the result of its status as a dissertation) and cross-references are only in terms of chapters and not pages. In terms of the assurance with which he handles an extremely wide range of sources, both material and textual, Price is hardly to be faulted (and indeed is greatly to be marvelled at), though students of Old Norse poetry might feel that Price’s source-criticism could at times discriminate more sensitively between different types of text (both generically and evidentially). In conclusion this is an exceptional book which deserves to establish itself immediately as essential reading for anyone interested in seiðr, shamanism, the Sámi, circumpolar religion, óthinn, violence, warrior ideology or simply the Viking Age more generally. Furthermore, literary students of the mediaeval sagas should pay attention to this archaeologist, for Price shows that saga accounts of ‘socially-embedded magic’ (p. 394) are not likely to be literary inventions of the post- Viking period, but rather ring true and have their roots in the shamanistic world-view of the Viking Age itself.